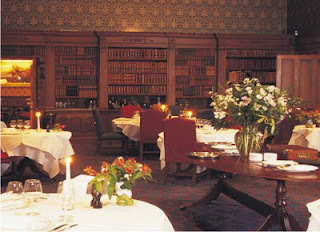 3 course dinner in The Library Restaurant for £25.00. One of the finest restaurants in Northumberland, the 2 AA rosette Library and Print Room Restaurant has a combination of classic and contemporary dining in stately surroundings. Our cuisine is carefully prepared using the freshest ingredients and in season meat and produce. Matfen Hall Hotel, Golf and Spa is situated in the charming village of Matfen and is the ancestral home of Sir Hugh and Lady Blackett. This stately home is set in 300 acres of parkland and has been a hotel since 1999. Enjoy true Northumbrian hospitality at Matfen Hall Hotel.